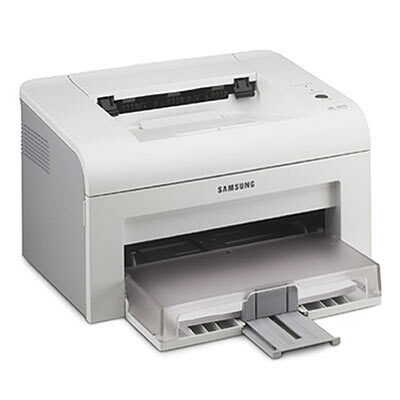 Introduced in 2005, the Samsung ML-2010 is a consumer-grade monochrome laser printer best suited for individual or home network use. Its features are fairly standard amongst other models like it and it may now be difficult to recommend, given that many other models like this one exist that are faster and more capable than this one. The printer measures a very small 14.1" by 11.8" by 8.5", compact even by the standards of personal printers. It will fit comfortably alongside other computer equipment, on its own table, in a cabinet, or on a credenza without any trouble at all. The printer produces sheets at a maximum speed of up to 22 pages per minute and at a resolution of 1200 by 600 dpi. It can print to plain paper, envelopes, transparencies, labels, and cardstock, and supports printing to Letter, A4, Legal, Folio, Executive, B5, A5, A6, Envelopes 6-3/4, 7-3/4, #9, #10, DL, C5, C6, B5, and Monarch envelopes sized between 3" by 5" and 8.5" by 14". It can also produce borderless photos sized 8.5" by 14". The printer has a maximum input capacity of 150 sheets in its multipurpose tray and 1 sheet in its manual feed tray, as well as a 100 sheet output tray. The printer includes a USB 1.1 port and 8 MB of memory, which cannot be upgraded, unlike a few other consumer-grade laser printers. However, for the most part this is standard for models like this one. Systems with USB 2.0 ports will be able to print to the ML-2010, though large print jobs may be slowed down by the fact that the USB 1.1 bus speed of 12Mbps is considerably slower than the USB 2.0 speed of 480Mbps. The printer includes support for most versions of Windows, many flavors of Linux, and Mac OS X. Automatic duplex printing is unavailable on this printer, as are other sophisticated paper-finishing options offered on industrial and professional-grade printers. The printer's maximum input capacity of 150 sheets, or less than half of a ream of paper, essentially disqualifies this unit from ofice use. Many small offices go through at least a ream of paper daily, which would require the printer to be reloaded over three times every day, which larger printers would not require given their capacities of well over 500 sheets. Networking support is not available without connecting this printer to a third-party external print server that connects its USB port to networking equipment. Also optional would be to connect the printer to other computers via printer sharing, though this would obviously create the inconvenience of requiring the host PC to be on at all times. The printer only supports SPL, or Samsung Printer Language. This may not be a problem for many users, but it does mean that printing from DOS applications may not be possible, as to do so requires the printer to be able to receive data in other print languages. Some users complain about this particular models heat, noise, and power consumption. It also features a "Toner Save" mode that supposedly does very little and does not in any realistic way help to conserve toner. Low quality paper often leads to paper jams in this model, especially when processing 30+-page documents. Furthermore, there's no means by which to gauge the amount of toner left in the printer, making it difficult to tell when to purchase replacement cartridges. A USB cable is not included with the printer. This is at most a minor inconvenience, but it is worth noting. Review it: "Samsung ML-2010 "
The ML-2010 ships with a starter cartridge rate to produce approximately 1000 sheets with an average 5% page coverage. 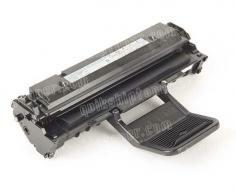 Replacement cartridges for the printer print 3000 pages with an average 5% page coverage. Like HP's printers, Samsung integrates drum units into their printers' toner cartridges, reducing the need for additional replacement maintenance but bringing up long-term costs. 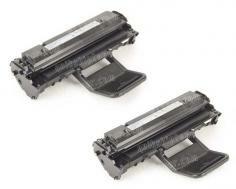 ML-2010 (ML2010) 2Pack of Toner Cartridges - 3,000 Pages Ea.